Handmade, jagged edges and all. Update: This is a picture from my "More than a Recipe" series. Everything in this picture is handmade by me. The little bowl is something I made in the pottery class I have been going to for the past 4 weeks or so. It was the first thing I made on the wheel. The clay I throw on the wheel always assumes a life of its own. In this case, it is the most perfect yet simple bowl I have ever made. The glaze turned out great, too. Since the glaze has been fired in a kiln at over 2200F, this bowl can be used to serve food, heat in the microwave and eat out of. The food in the bowl was supposed to be til gul. Or tilache ladu. But the gul or the jaggery was not the sticky kind and the ladus flopped miserably. I had over 1 and half cups of sesame seeds, 1/4 packet (1/4 kg) of jaggery, 1/4 cup of peanuts and a couple of tablespoons of coconut powder vested in this so I was not ready to give up yet. I greased a small casserole dish, pressed the hot mixture into it and heated it in the microwave for a minute at a time, pressing it down further after each minute. I cut it and let it cool. But the darn thing was stuck to the casserole and I got all kinds of wierd shapes when I tried to pry it out. 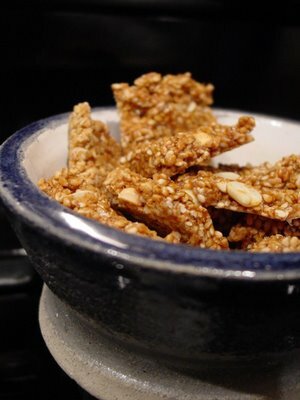 My family, who had previously scorned at my efforts to make til gul, helped themselves to this new avatar of til gul, tilachi chikki or sesame brittle, with abandon. That gave me enough incentive to try again with what was left. Only this time, I lined the casserole with wax paper. It worked. Kind of. There was nothing stuck to the casserole. The wax paper on the other hand was one with the chikki. I pulled out as much as I could. The rest, we just ate along with the chikki! manisha, chikki looks great..waiting for the recipe? is it tilgul that we make on makar sakranti? Krithika, Meena, Anupama, you are all correct, of course. But there was more to the picture than just the food. I've updated my post with the rest of the story. The recipe for til gul was adapted from Mumbai Masala. I thought those were "chikkis". Didn't know you wanted to take til laddus. Have never tried making the til laddus, I feel they are too difficult for me to manage :). Shilpa, I've made tilache ladu before. My palms were scorched by rolling the hot mixture but this mixture wouldn't come together. I had to heat it even more and there was no way I could touch it at that temperature. If I get the right kind of gul (jaggery), I will make til gul. But I think I will have to wait for gul from India for that. Nice bowl! Beautifully glazed too. When I was trying my hand at the wheel it took forever for me to get the first bowl! But it was very satisfying. Lucky you (do you have your own wheel and all?). Anita, I'd love to have my own wheel! I go to a local pottery studio where they have classes for both adults and children. I'm not so good at the wheel - while I caught onto centering the clay quickly, things tend to take a life of their own from that point! I usually just go with the flow. And, as you said, I find it immensely satisfying. The time I spend at the studio are almost like a form of meditation. There were times when it was very frustrating but I quickly realized that the problem was me: too many expectations. As soon as I let go, it became a relaxing and re-energizing experience!